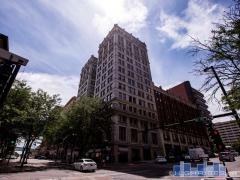 The Paxton is a luxury condo building located in the heart of Downtown Omaha. Amenities include concierge services, private storage, a fitness center, covered parking and a rooftop deck. The building is within walking distance of Omaha's business, arts, and entertainment scene including The Old Market District, The Orpheum Theater, The Holland Performing Arts Center and the Gene Leahy Mall. Have any comments or questions about The Paxton? Ask your question and/or share your thoughts about this Building.